Applied Bank, headquartered in Wilmington, Delaware, is a Delaware State Chartered Bank. Since it was founded in 1996, it has been delivering attractive and competitive financial products and services at an exceptional level of quality that exceeds consumer’s needs and expectations. 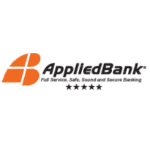 Applied Bank offers secured credit cards to people with little or no credit history, which they can use responsibly to repair credit rating and improve credit scores. If you have limited or no credit, you would like to build your credit gradually and secured credit cards can be your best choice. If you have fallen hard financially and have damaged your credit, you may also rebuild your credit history with secured credit cards.